Director/Writer: Steven James Creazzo / Cast: Vincent J. Mazella, Denise Filosa, Steven James Creazzo, Ronnie Petricevich, Jaimi Williams, Bob Fletcher. A man returns to his hometown several years after his parents were murdered. The killer was never found. Everyone thinks he did it. Some of the locals have knowledge of the facts and they find themselves eliminated by a loon in a rubber skull mask. 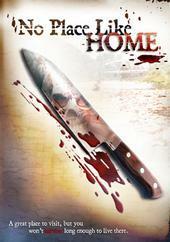 As if the camcorder footage isn’t painful enough, the acting, gore effects and even wardrobe all serve to magnify how horrible watching No Place Like Home is: one of the two cops in town wears a variety of sleeveless tops in pastel colours and with a huge pirate-style earring and Seagal-themed mini-ponytail. And where the hell did the two children disappear to? While credits outtakes show just how low budget this film was, it’s only worth watching if you like horrendously slow fist fights, girl fights, and the pinnacle of stunts is a guy jumping over the bonnet of a car. tagged with I want to die, Nu-di-ty, slasher, what the hell! ?, who finances this crap! ?